Tiaras are special because they're beautiful works of art, but some of them are doubly interesting because of their royal pasts. Every now and then, one of today's princesses wears a tiara that came from a royal house of the past. Today's tiara, the Savoy-Aosta Tiara, is one of those -- it started off with a branch of the former reigning family of Italy, and now it graces the head of a Belgian princess. Although we mostly associate it with Italy, the tiara’s history traces back to a French princess, Anne of Orléans. She married her first cousin, Prince Amedeo of Savoy, in 1927. The first images of Anne wearing the tiara show her using it 1920s style, wearing it low across her forehead as a bandeau. 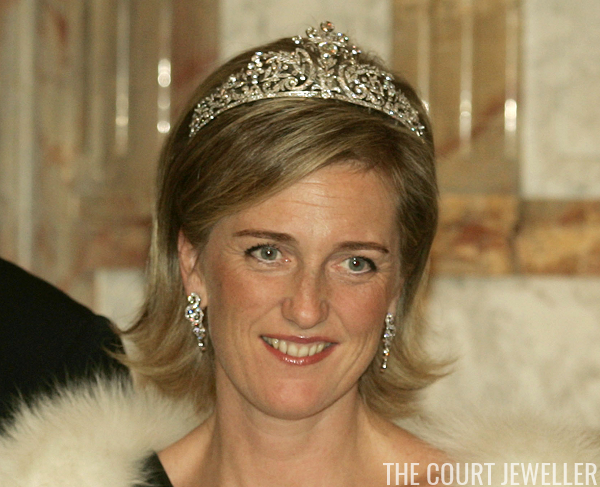 The tiara is an all-diamond piece, likely set in platinum; it features floral and scroll motifs in its design. Amedeo became Duke of Aosta on his father’s death in 1931. He commanded the Italian forces in East Africa during World War II, and he died as a prisoner of war in Kenya in 1942. Because he and Anne had only daughters, the Aosta title passed to his younger brother, but the tiara stayed with the women of the family. Above, Anne wears the tiara around 1955. Anne loaned the tiara to another Savoyard princess, Maria Beatrice (daughter of King Umberto II and Queen Marie Jose), for the wedding of Infante Juan Carlos of Spain and Princess Sophia of Greece and Denmark in 1962. She's pictured above on the right wearing the tiara at the wedding; her sister, Maria Gabriella, is walking beside her. Anne’s elder daughter, Princess Margherita, also borrowed the tiara for a significant royal wedding: the nuptials of King Baudouin and Queen Fabiola of Belgium in 1960. Margherita would eventually inherit the tiara from her mother — and she would also find herself further connected with the Belgian royals. In 1953, she married Archduke Robert, one of the sons of last rulers of Austria-Hungary, Emperor Karl I and Empress Zita. In turn, Robert and Margherita’s son, Lorenz, married Princess Astrid of Belgium in 1984. 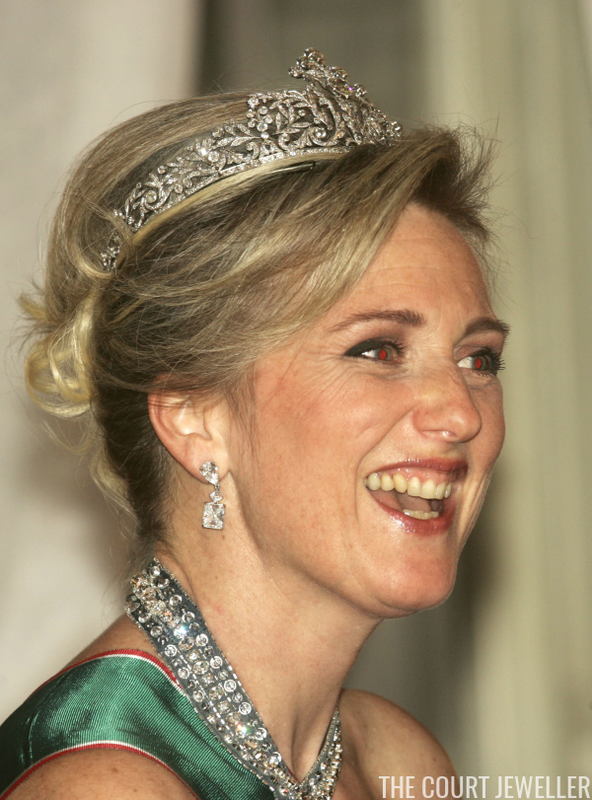 Astrid is the only sister of King Philippe of the Belgians, and as such, she regularly attends white-tie events. But we’ve talked at length about the relative tiara poverty of the Belgian royals, so perhaps it’s no surprise that Astrid turned to her husband’s family to find a suitable sparkler. She recently borrowed her mother's art deco bandeau for a banquet, but this is the only other tiara she's worn in public. 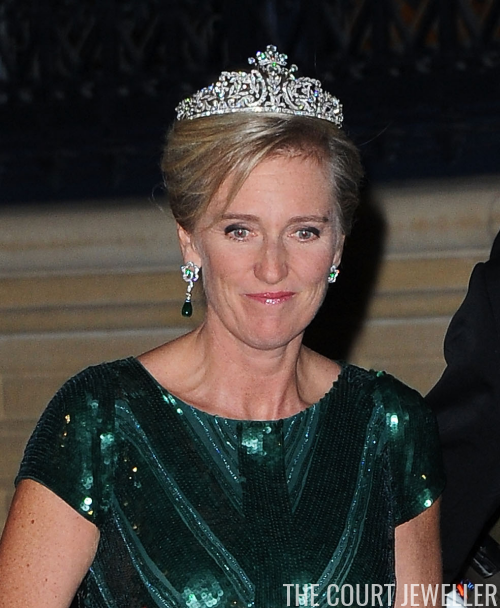 Although the tiara could still technically belong to Archduchess Margherita, it seems to have been all but given to Princess Astrid. She wears the piece exclusively today, at events ranging from state visits to royal weddings. (It’s often erroneously said that Astrid’s sister-in-law, Archduchess Katharina, wore the Savoy-Aosta Tiara at her wedding, but that’s not the case. Katharina, who is the sister of Princess Sophie of Prussia, wore the Isenburg family's floral tiara, which has a similar profile but a different design.) It only seems fair, really, that a tiara belonging to the Savoys would end up in Belgium, as other Belgian tiaras (like Queen Marie-Jose's seed pearl tiara) ended up with the Italian royals. Perhaps tiara turnabout is fair play?